This website is primarily intended to help Māori land owners and managers to find out more about the physical characteristics, constraints and potential of their Māori land blocks. 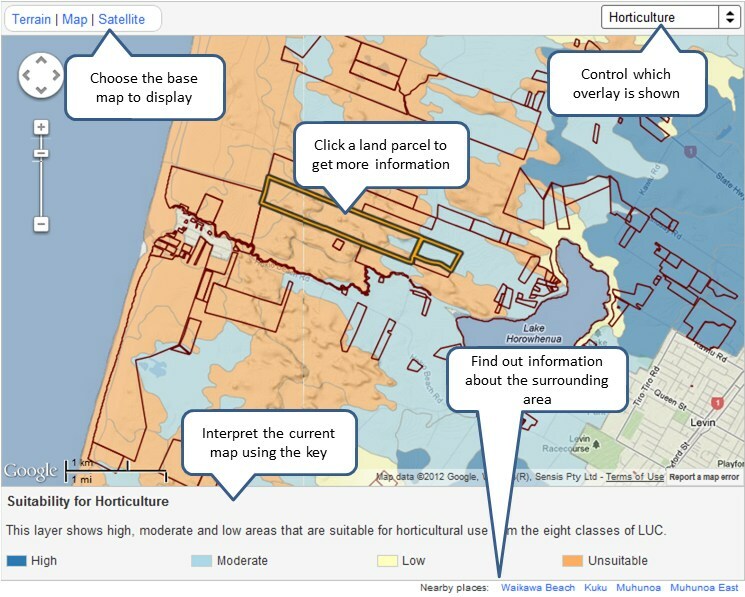 At this stage it uses a range of land resource and environmental information. This tool is categorised as prototype and has been released for feedback and comment to inform the development of a final version. We welcome your thoughts and comments on the design of this tool. Firstly you could type the registered name of the land block (such as "Rangitoto A 24B") into the search box at the top of the page. Any parcels found which contain the search term in their title will be displayed on the search results page. Clicking on the search result link for a parcel will take you to the details page for that parcel. Secondly, you can use the map controls (or mouse controls) to zoom in and move around the map. When you have found the land parcel you want to query, click on it to learn more about it. Finally, if you do not know the registered name or exact location you can also type the general locality of the land block (e.g. "Rotorua") and any New Zealand places which contain the search term will also be displayed on the search results page. Clicking on the search result link for a place will take you to a locality map where you can use the map controls to locate the land parcel you wish to query. Once you click on a land parcel you will received a map bubble that contains some basic information about the selected parcel. If this is the parcel you wish to query in detail then click on the “more details” link at the bottom of the map bubble. The map is the key way to locate parcels and to visualise the locations of the Māori land blocks. There are four key aspects to understand about the map. Firstly, the map tools enable the panning and zooming of the map. Secondly, the underlying map can be changed based on your personal preference, the default is titled as “Terrain” and provides a representation of the topographic landscape. The other two options are “Map” (providing a cartographic representation of the roads and other features) and “Satellite” (providing satellite images of the landscape). Thirdly, the types of information being visualised can be changed based on your preference. The drop down box has eleven geospatial layers that you can visualise in relation to the Māori land blocks. These layers range from the “Suitability for forestry” through to the “Historical extents of wetlands”. Finally, the legend provides some context in relation to the type of information being visualised. Once you have selected a land parcel to view in more detail a new page will load that contains a range of information about the physical characteristics, constraints and potential of the Māori land block. The map operates as outlined in the previous section. The information about the parcel is split into four sections: Title Information (factual information about the Māori land block), Climate information (average climate statistics for the Māori land block), Land Capability (information about the capability options for the Māori land block), and finally Land Cover (current and historical land cover information for the Māori land block). Each of the images provides a description or more detailed information when the mouse cursor is placed over the image. For example when the mouse cursor is placed over the stars listed under the question “What is the potential of this land?” under the Land Capability tab, a title and short description of the class is displayed. Additional technical information about the attribute is provided via the “Learn More . . .” link at the bottom of each section. It is hoped that this information will help to inform the owners of the Māori land block. However we also acknowledge that this is a work in progress. We welcome your thoughts and comments on the design of this tool and on the types of information conveyed. Please use the “Give Feedback” link to help us develop this tool. For more information about the information used in the portal please visit our About page. A more detailed description of the information can be found on our overview of the scientific and technical concepts used in this website.